The RoboPeak RPLidar module provides an interface to the RPLidar device. The RPLidar is a low cost lidar sensor suitable for indoor robotic SLAM application. It provides 360 degree scan field, 5.5hz rotating frequency with guaranteed 6 meter ranger distance. RPLidar is the ideal sensor in cost sensitive areas like consumer robotics and hardware hobbyists. Special thanks to Dave Everett for the loan of the RPLidar. Be sure to visit this Robot Workshop in Sydney. 1. COM Port - Specify which COM port the RPLidar is attached to. Once connected the Green connection bar will show and the device Model, Firmware and Serial number will appear in the interface. 2. Remember As Default - Select the "Remember as Default" checkbox if you would like the current COM setting to be remembered by RoboRealm such that whenever the lidar is loaded the COM port will be auto-selected. This ability allows you to not have to constantly change the COM port when loading in successive RoboRealm configurations. 3. Filter - To smooth out the signal and avoid gaps you can smooth the distance values coming in from the lidar within their local neighborhood. 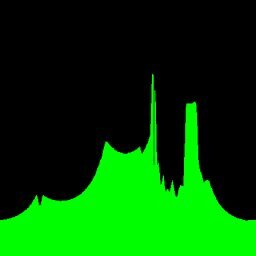 Thus noisy spikes are reduced as their previous and next angular measurements are averaged into each value. 4. Display Zoom - Select how much zoom to apply to the current view. Auto will detect the furthest object and scale the display accordingly. This may cause the map to jump in scale as distant parts are typically noisy. 5. Display Fill - Check if you want the graphic to be filled with the specified color as apposed to an outline. 6. Display Chart Type - Select how you want the values to be displayed. Radial - Displays the range points connected as you would expect them to be seen in reality. 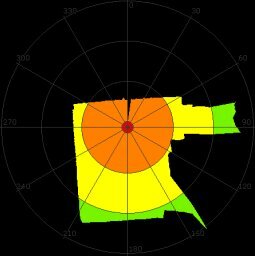 Note that areas perpendicular to the sensor are connected despite no actual values being present. (i.e. changes in depth are connected between values). Cartesian - Displays the range values in a traditional XY chart. Intensity - Displays the range values as a single row with intensity values based on actual range. Brighter objects are closer. 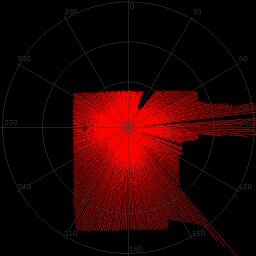 Points - Displays the raw points as received from the laser scanner. 7. Display Color - Select the color you want the graphic display to use. 8. 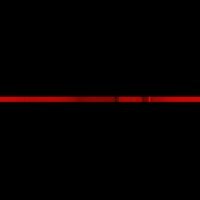 Graphic Size - Select the line, or point size that should be used when displaying the graphic. 9. Average Statistic - Select if you want a variable to be created that indicates the average of all the range data. 10. Maximum Statistics - Select if you want a variable to be created that indicates the maximum distance within the range data. 11. Minimum Statistics - Select if you want a variable to be created that indicates the minimum distance within the range data.